Styled with rosalee pant . Such a softie. This longsleeve is made with extra-fine merino wool from Italy. It has a slouchy silhouette with drop shoulders and a subtle mock neck. 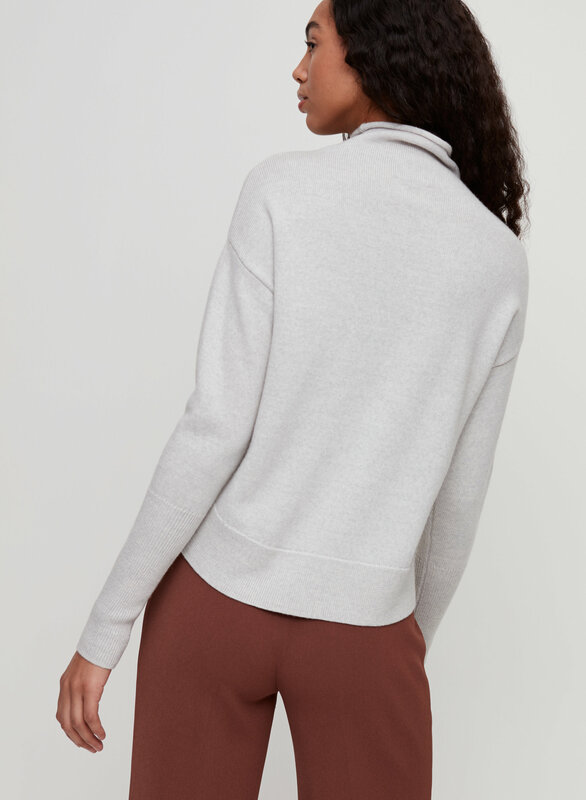 I bought this sweater in two colors: carmin and light grey. Love both! First saw lots of reviews recommended it but did not pay much attention. Bought tamarind color in xxs. 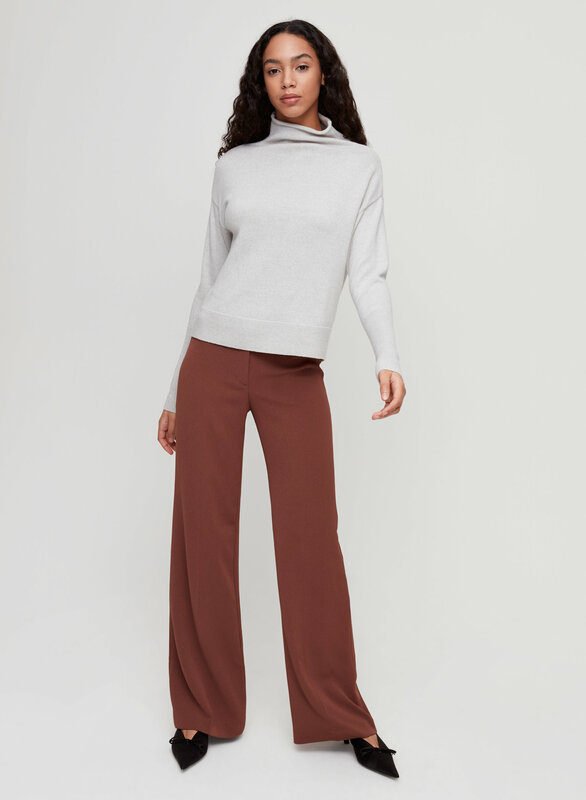 I usually get xs but xxs also works as a cropped sweater to pair with high waist pants or skirts. Received lots of compliments. Later I got the green valley color in s. Such a beautiful green forest color. It provides more room and different style than xxs. This was the second cyprie sweater I bought because I accidentally shrank the first one. The quality of the wool is great and the fit is also very flattering for petite figures. For sizing I’m in-between an XS and XXS, I went for the XXS so it hugs the curves just a bit and doesn’t look boxy. 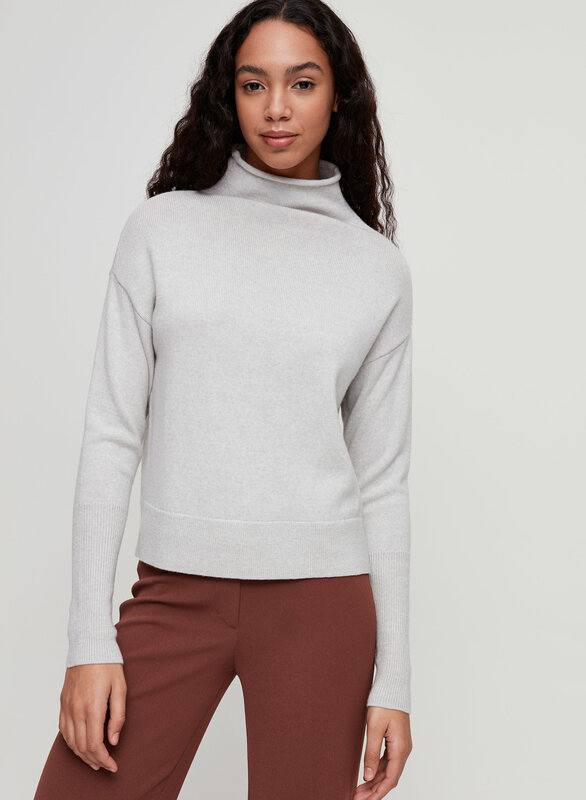 Nice basic sweater that goes with everything. The deep green colour is a nice change from the typical black colour which adds a nice subtle touch. I heard many good things about this sweater, it fit okay, but I didn't feel anything special about it at all. I have this sweater in cashmere as well so I tried it in the traditional material and love it. The shape is flattering with tights for a casual look and it’s easily dressed up with pants for work. Love color and soft comfort! I’m so happy with this sweater. It’s so beautiful and it looks amazing on! This is a great sweater! It is warm and not too bulky. It's got a great shape and pairs well with everything! 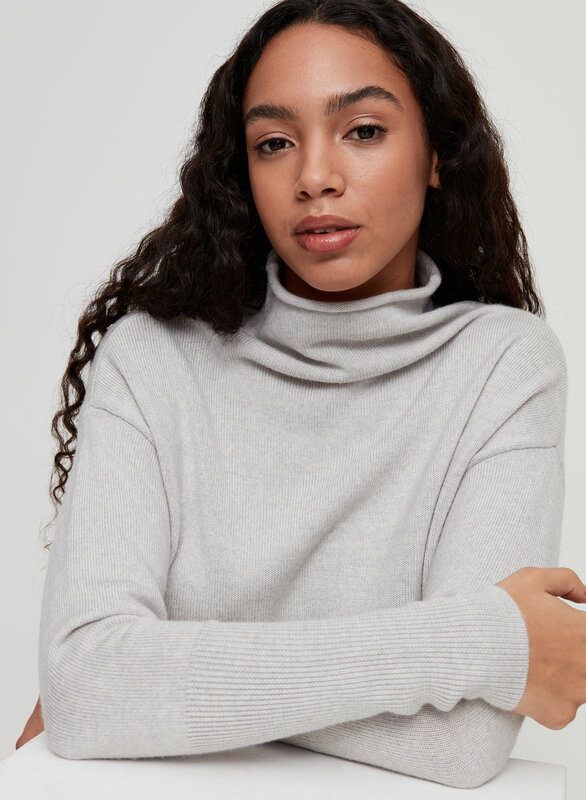 Love the smaller turtleneck on this! I love the casual fit, and how it's not cropped! Easy to tuck into high waisted pants. The ribbing on the forearms help make this very flattering. I'm usually an XS in Aritzia sweaters, and I have both sizes in this. I definitely prefer the S though. Lovely Sweater to have in your wardrobe! I LOVE, LOVE, LOVE this sweater! I have owned this sweater in Black, Lillooet, Green Valley and Legend. This sweater is a great piece that looks as good with a dressy skirt or jeans. (even culottes with boots!) The only reason I didn't give the 5 stars rating is because the sweater did shrink a bit after a wash with the cold cycle. Overall it's a great piece to have in your wardrobe! Great sweater! Warm, soft wool. Great length and flattering cut. Easy to dress up or down. The Cyprie sweater in Legend is absolutely gorgeous. Such a beautiful purple colour. The length isn't too long, which I normally prefer but it isn't too short either. 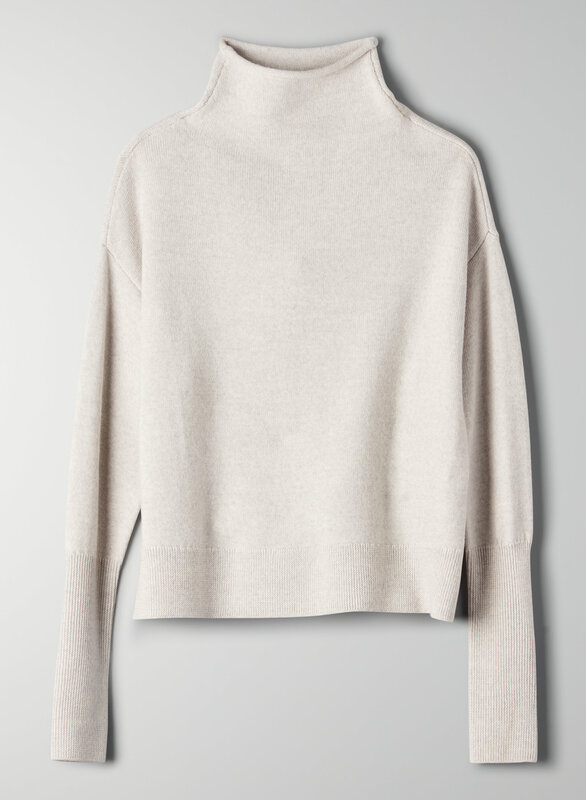 I think this sweater is simple but looks classy. This sweater is great for both a casual or night out.